When it comes to cooling tower services, we believe that having a cooling tower specialist that can cover all your cooling tower needs is the best option. That’s why we work so hard to offer a full range of cooling tower services. We offer four basic types of cooling tower services that cover almost any cooling tower need. Cooling tower construction: One of the key cooling tower services offered is new cooling tower construction. Inherent in this service is the design, engineering, manufacturing, construction and service for new cooling tower projects. Our new tower construction services are versatile and can meet any need because Midwest can handle design and construction of counterflow, crossflow, and ethanol cooling towers. Repair and emergency: Repair and emergency services are essential for any time when a cooling tower is offline, for whatever reason. Down time means costly delays so access to swift emergency repair services is a must. Reconstruction and upgrades: At the heart of the services we offer is our reconstruction and upgrade cooling tower services. Experienced engineers and design staff can create cost effective solutions for even the most challenging cooling tower design. Maintenance and support: Prevention and maintenance are the best way to avoid the costly delays of downtown or the large scale changes brought on by reconstruction. Proper support and maintenance can increase thermal performance, reduce unplanned maintenance and emergency shutdowns, and reduce overall maintenance costs. We also offer cooling tower thermal performance testing, cooling tower inspections, cooling tower optimization and upgrades and even temporary cooling towers. These cooling tower services cover everything from new construction to support for existing towers, and everything in-between. Cooling tower construction has evolved over time as environmental concerns and new materials have become available. Although FRP is now the preferred building material, the transition from wood cooling towers to more durable materials is an interesting journey beginning with redwood construction. At the very beginning of cooling tower construction, the natural ability of redwood to inhibit decay made it the preferred material for cooling tower construction. Eventually redwood supply diminished and the building material of choice, while still wood, began to shift to Douglas Fir. While stronger, Douglas Fir decayed much faster than Redwood. To combat the decay of cooling tower lumber pressure treatment and incising were employed. In the pressure treatment process, an aqueous solution of CCA is applied using a vacuum and pressure cycle, and the treated wood is then stacked to dry. During the process, the mixture of oxides reacts to form insoluble compounds, helping with leaching problems. The process can apply varying amounts of preservative at varying levels of pressure to protect the wood against increasing levels of attack. Increasing protection can be applied (in increasing order of attack and treatment) for: exposure to the atmosphere, implantation within soil, or insertion into a marine environment. Incising encourages the wood to accept chemical treatment by the process of adding small incisions along the wood. Environmental concerns began to take their toll on wooden cooling towers as public consciousness of leaching grew. Concerns over leaching, the loss of wood preservative chemicals into the water flowing though a cooling tower, eventually led to stricter industry controls and new chemical preservative formulas. Combined with advances in steel construction, the growing cost of combating environmental concerns about wooden cooling towers caused the building material to fall out of favor. Type 304 stainless steel became more popular as the corrosion potential increased. 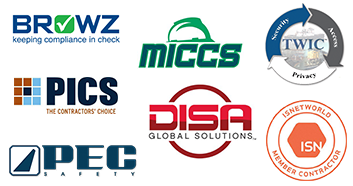 Manufacturers simply substituted stainless steel for galvanized steel components. Due to cost constraints, just the cold water basin was typically up graded to SST. There were some unfortunate occasions where galvanized and stainless steels were fastened together below the water line causing rapid deterioration of the galvanized steel at the joint from galvanic action. Anyone considering mixing these materials must pay attention to the surrounding materials- particularly the fasteners. Such joints should never occur below the overflow level of the cooling tower. Specifiers will sometimes call for type 316 SST. This is ok for nuts, bolts, and some small sub assemblies but it is largely incompatible with the tooling used by the manufacturers. It is also difficult to form. For these reasons, it is largely unavailable. The galvanized steel cooling tower has remained the factory assembled standard. The thickness of the steel has steadily declined with more economical designs but the thickness of the zinc layer has steadily increased to a current standard of G235. (Or, 2.35oz. of zinc per sq. ft.) from a 1970’s standard of G90 (.90 oz/sq.ft.). This thickening of the sacrificial zinc layer has a very beneficial effect on cooling tower life. Various enhancements to the galvanized steel in the form of barriers have been employed by some manufacturers. Their suitability largely depends on the local water quality. Concrete can be an excellent construction material for basins- even side walls, fan decks, discharge stacks, and mechanical support beams. Its use beyond basins, however is not typically justified for commercial applications. Extensive concrete construction is used for architectural reasons- where the tower is disguised to look like or blend in with a building- or, the cooling tower is designed as a structure with a life expectancy equal to the facility it serves such as a hospital or university. In our last two posts we’ve covered what makes a cooling tower work and the basic types of cooling towers. We’ve touched on some of the basic cooling tower components in our last post, but in this cooling tower fundamentals post we’d like to dig a little bit deeper into the parts that make up a cooling tower. Most cooling towers revolve around fill, also called wet deck or surface, which is generally a PVC film type. The purpose of the fill is to maximize the contact between the air and the water, which encourages evaporation. Fill is covered in a textured patterns, usually ridges or wrinkles, so that when pieces of the fill are placed together they leave open spaces for water and air to travel. These spaces, called channels or flutes, are typically angled so that the water takes the longest possible time to travel their lengths. Individual pieces of fill are glued together to create blocks of fill which come in a variety of thicknesses and heights. Selecting the right flute size is very important when designing a cooling tower. The smaller the flute size the higher the capacity per cubic foot, the less volume, and as a result lower costs. A marble sized flute would be more cost effective than a golf ball or baseball sized flute, and is this size is typically used in clean water application. So why use a larger sized flute? In dirty water applications, like steel mills, small flute fill would become clogged, or not work at all. A bigger, less effective fill is certainly preferable to a cooling tower that doesn’t work which is why choosing the most effective fill is vital for each cooling tower. Bar type fill is far less effective than film fill, but is suited to extremely dirty water applications. When bar type fill is used, water is splashed into droplets by being plashed off of splash bars throughout the tower. Although the surface area of droplets is less than when water is spread through film fill, bar type fill allows for debris to pass through the tower and is easier to clean than film fill. Eliminators are used to minimize drift. Drift is any water droplets that escape into the cooling tower discharge air. Typically they provide multidirectional changes of airflow, and a well designed eliminator will greatly reduce water loss. Spray trees can take the form of either single spray heads or, when wider coverage is needed, multiple spray heads. They are used in counterflow cooling towers to distribute water as uniformly, with minimal pressure requirements, as possible over the wet deck. There are two types of water basins- hot and cold. In a crossflow tower a hot water basin takes the place of the spray tree and is used to distribute the water. A distribution or hot water basin consisting of a deep pan with holes or nozzles in its bottom is located near the top of a crossflow tower. Gravity distributes the water through the nozzles uniformly across the fill material. Cold Water Basins collect cooled water at the bottom of the tower. They are an integral part of factory assembled designs and are built in place- typically of concrete- for field erected towers. A Make-up Valve replaces water that exits via evaporation and bleed with fresh water. It operates somewhat like the valve found in a conventional toilet tank but is bigger and more heavy duty. Like toilet tank floats, they can function mechanically or hydraulically. There are a lot more components that go into a cooling tower than the few we’ve discussed here, including some designed for cold weather operation. If you’re interested in learning more about cooling tower components subscribe to the Cooling Towers Blog to get the next cooling tower fundamentals article, Cold Weather and Components. What Makes a Cooling Tower Work? Let’s start with the most basic example of the principles behind a cooling tower; sweat. When the human body gets too hot and needs to shed excess heat, it begins to sweat. The sweat then evaporates and creates a cooling effect over the surface of the skin, which lowers the internal body temperature. Spreading water over a surface, exposing it to the air, causes the water to evaporate and produces a drop in temperature. Not all air is created equal, however. Have you ever been somewhere with extremely high humidity, begun to sweat, and noticed that your sweat wasn’t evaporating? If you have, it is because not all air can accept the same amount of water vapor. There is only so much moisture that air can accept, so the process of cooling through water evaporation works best in very dry air. This is why the dry heat of the Arizona desert seems more bearable than the humid heat of the Florida summer, even though the desert’s temperature is actually higher. These ideas are what make a cooling tower work, but there is a lot more water to cool and evaporate in a cooling tower than the small amount of water the human body generates as sweat. Which is why a cooling tower adds in a few other factors to the equation; like, fans to replace air that is already saturated with moisture, devices to constantly circulate the water over the surface, the ability to continuously add water to replace evaporated water, and a heat source to make sure the runoff is heated. While cooling towers, their maintenance, and their construction are complicated topics the basic ideas behind how they work are no sweat. The most confusing of these specifics is the wet bulb temperature. The wet bulb temperature is used to determine the relative humidity, which changes throughout the day. 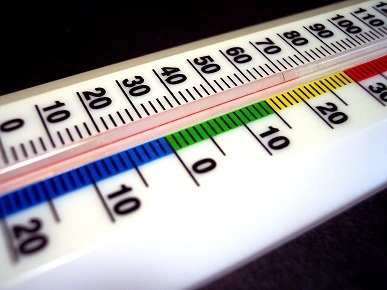 The relative humidity is found by comparing the temperature of a dry thermometer with the temperature of a wet bulb thermometer. The wet bulb thermometer has water placed on its bulb, air is passed over it, the water evaporates, and the temperature is recorded. Most of the time the two thermometers will have different temperature readings, however, if the air is completely saturated with water the readings will be the same. When 100% relative humidity is reached the air can no longer accept water, the water on the bulb cannot evaporate, and the temperature will be the same as the dry bulb. So, the lower the wet bulb reading, the lower the humidity, the more moisture the air can accept, the more heat a cooling tower can be expected to reject. 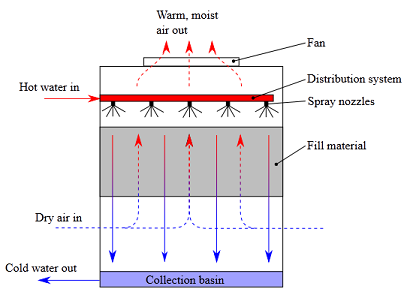 Many wet bulb readings are taken and recorded to determine the maximum wet bulb reading; the size of the cooling tower is determined by the max wet bulb reading. When sizing a cooling tower you want to err on the side of caution and size for the highest wet bulb reading because, your tower will then be oversized and the leaving water temperature will simply be lower. How Fast Does a Cooling Tower Transfer Heat? A cooling tower doesn’t actually control the rate of heat transfer; a cooling tower only transfers the heat it has been given. Heat transfer and evaporation rates do not vary, regardless of the size of the cooling tower. Wet bulb temperature, along with cooling tower size and flow rate, determine inlet and outlet water temperatures. 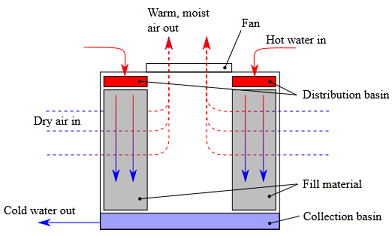 However, the difference between inlet and outlet temperature is not determined by the cooling tower. For example, you could cool water from 90 to 80, or 100 to 90, but the 10 degree difference is not affected by the size of the tower. So, while you can’t change the rate of heat transfer, you can increase performance by increasing the surface area or booting the cfm. Subscribe to the Cooling Towers Blog to get the next cooling tower fundamentals article, Cooling Tower Types.